This is probably the App that will be my most expensieve buy for iPad, but it is worth it. I decided to write down properly my files for websites, my texts – creations, … and for that, I needed more than a notepad or a note taking app. Also, one of my requirement was that footnotes were to be supported, which is not easy to find. Search and replace, graphics, and styles are a bonus. 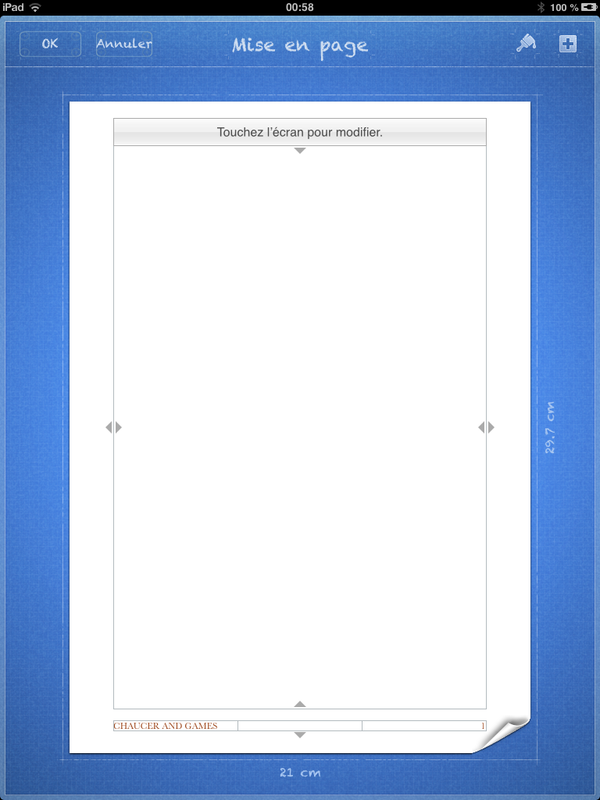 It is possible to open a document (Word, …) or to create a new one, empty or based on a model. 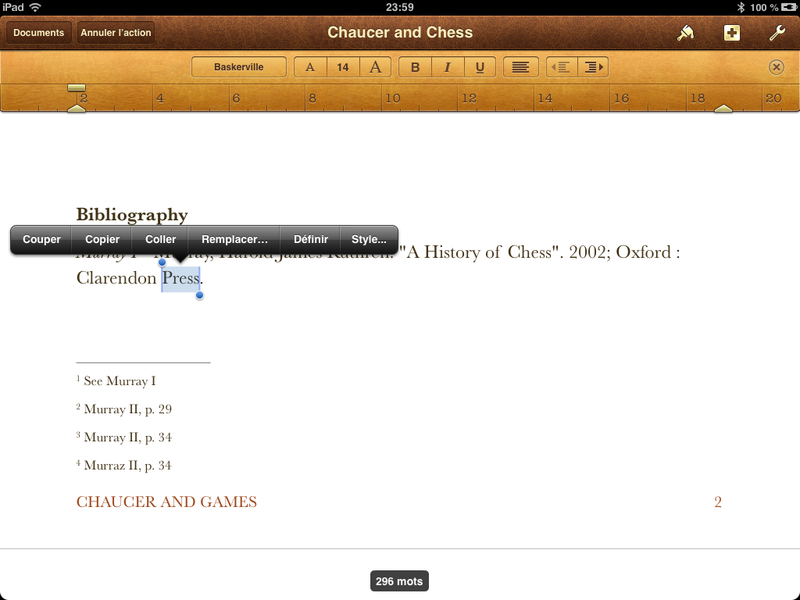 Once the text is on screen, you have a word count, base settings (alignment, size, …). By selecting a word, you can obviously copy it, but also get the definition, synonyms, and the style. 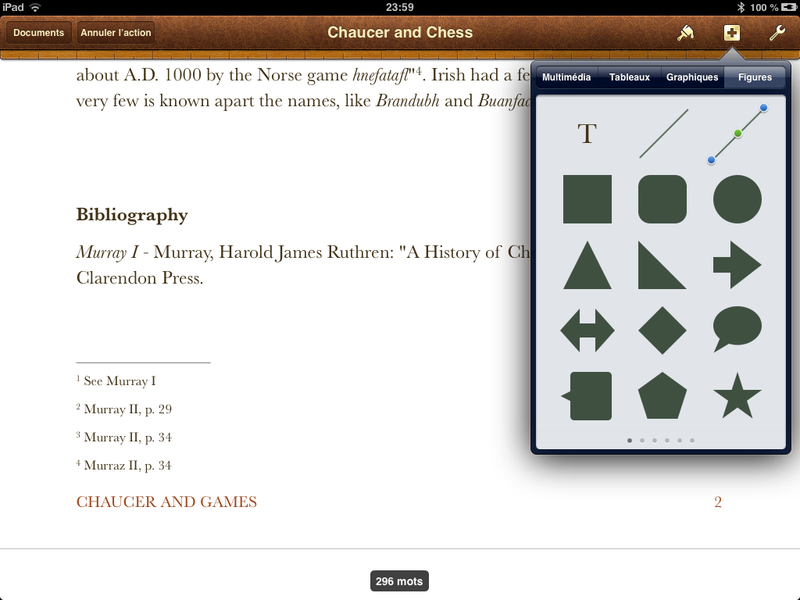 Insertions include images, charts, tables and shapes. You can choose the margins, footer and header, etc. The fourth image shows sharing / printing. 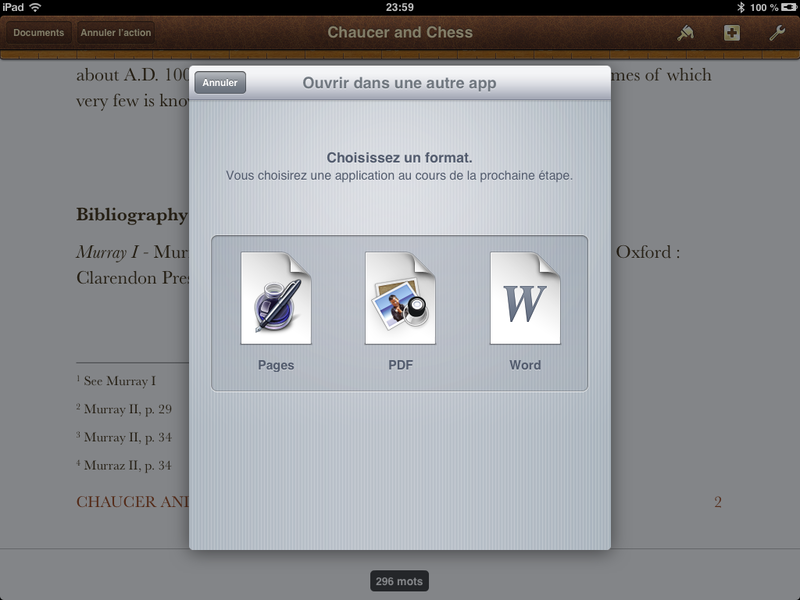 Knowing you can put your file into Word format and share it in your dropbox… the world is yours! Yes, it seems a bit expensive. But I found NO other App, free or paid, that does as much as Pages. Since it is only paid once (so you get it on your iPhone too if you pay it on iPad), and that there are no additional paying content, it is worthwile. I do not know for you, but the missing details are, for me: Landscape pagination, and modifications follow-up, and that is about it. And it is not especially vital in the iPad context. Ça m’a l’air une bonne application. Tu dis qu’il n’y a pas de gestion des suivis de modification, mais est-ce qu’il y a la possibilité d’ajouter des commentaires (en marge) ? Pour moi c’est de plus en plus une fonction vitale dans n’importe quel éditeur/visionneur de document. Hum, bonne question, j’ai même pas pensé à essayer… voyons voir… Alors j’ai pas l’impression “as such”, mais tu peux insérer des cadres de textes, donc tu pourrais travailler avec ça, peut être ? Oh, ben, bonne nouvelle: la mise à jour de Pages inclut maintenant le suivi des modifications !